KABUL, Mar. 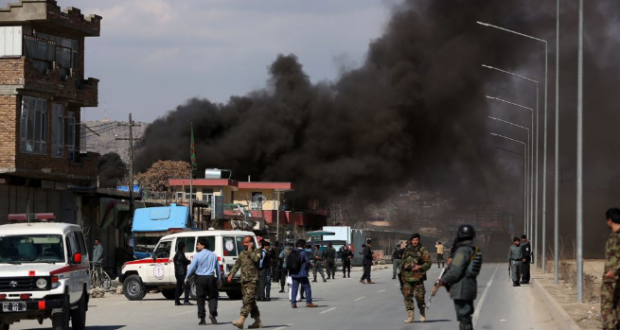 01 – Mujahideen of Islamic Emirate have launched coordinated attacks on 3 key enemy targets inside Kabul city amid the ongoing ‘Omari Operations’ at around 12:00 pm local time today. The first attack took place on the enemy Recruitment Center also known as Military School, beginning with use of explosions to remove obstacles followed by multiple martyrdom seekers entering the building and killing the hireling personnel busy in their studies inside. The second attack targeted PD6 Department. It also began with use of explosive to remove barriers followed by martyrdom seekers entering and engaging the enemy personnel inside. Later a car bomb was set off on the reinforcements inside the department, killing and wounding dozens as well as destroying a large part of the building. Mujahideen have currently cleared the second floor by killing all the gunmen and have taken up positions to engage further reinforcements. The third attack in which explosives were used targeted an intelligence building inside 241 Qit’a (Unit), killing and wounding many gunmen as well as heavily damaging the building. Reports say that clashes are still ongoing at all 3 sites inside Kabul with the heavily armed martyrdom seekers engaging enemy troops approaching the areas. Martyrdom seekers directly in contact report that they have killed dozens of police, army and intelligence personnel at all 3 sites so far. The enemy is confused and in a state of shock while the martyrdom seekers are battling the hirelings with high spirits.